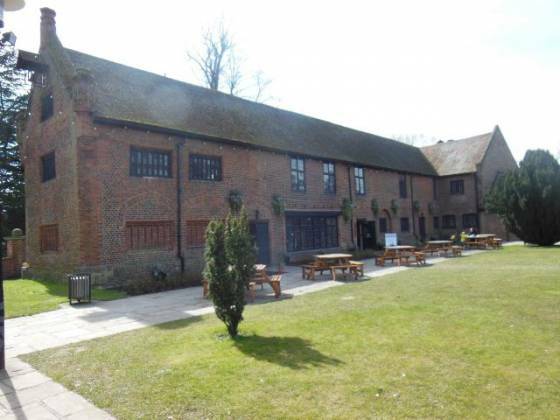 Tudor Barn came on my radar when I was looking for a lunch venue in Greenwich for Easter Sunday. The pricing seemed reasonable, and it was close to home. Unfortunately, they were booked up, so I decided to reserve a table for Sunday lunch the following weekend. Our first roast review in Eltham! Tudor Barn is actually set within Well Hall Pleasuance, a park area with various activity areas and even a moat. Very picturesque, and a stark contrast to the seemingly urban streets around it. There didn’t seem to be any parking set aside specifically for Tudor Barn, but we found a spot close to one of the gates (I am not sure on parking restrictions outside of Sunday). After a short walk through the park we saw Tudor Barn standing in the middle of the green; a large, quite foreboding and impressive building. There was a green lawn area outside, with a number of benches and tables – this would be pleasant in the spring and summer. We entered Tudor Barn itself, and were met with a bar and seating area. Ordered a pint of Holsten Vier (£3.30) for me, and a soda water for Claire (£1.00 – John William, our baby, didn’t have anything ;-)). We were then shown to our table, a 3 seater at the far end of the building, near the restrooms. There was a wood burning stove behind me which pumped out hot air – whilst nice to begin with, it did get a bit uncomfortable later on. The walls were painted white, and abstract art adorned them – I quite liked the artwork, it was a bit of a miss for Claire. And, in the name of the building, there were exposed beams all over the place. The table was already set for lunch, with thick cotton napkins and a table cloth. The chairs were upright, back supported leather and extremely comfortable. With all of this combined, I was definitely pleased we booked our Sunday lunch here! Menus were provided as we sat down, and we were informed what the soup of the day was (I believe it was carrot) – so many places forget (read – can’t be bothered) to tell you, so it was nice not to have to ask. They had several starters, including a chicken liver roulade, soup of the day (of course), and a goats cheese & truffle parfait. 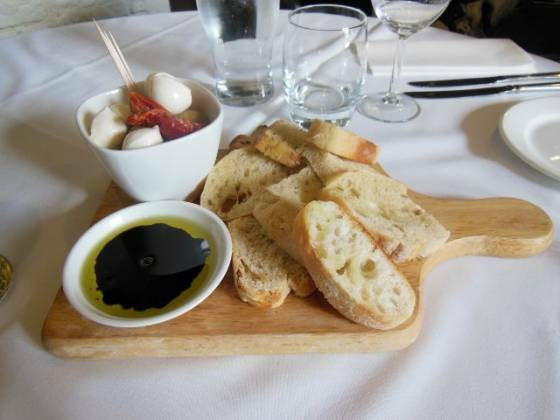 We decided to share the breadboard, and pay the extra £2 for the mozzarella sun-dried tomatoes and olives. Claire then ordered roast lamb for main… me, it was too easy – they sold a “duo of meat” for £13.95, so I just had to go for that! The starter was brought out quite quickly, it looked impressive. The mozzarella etc was in a small dish on the side, and a little bowl for olive oil & balsamic vinegar (bottles already on the table). I’m not really one for tomatoes, olives nor mozzarella so whilst Claire ate them, I indulged with the bread. The bread was good quality. I was told that the extras were quite good as well. Once we had finished, plates were taken away and replaced with horseradish, mint sauce and mustard in pots (all without being asked). 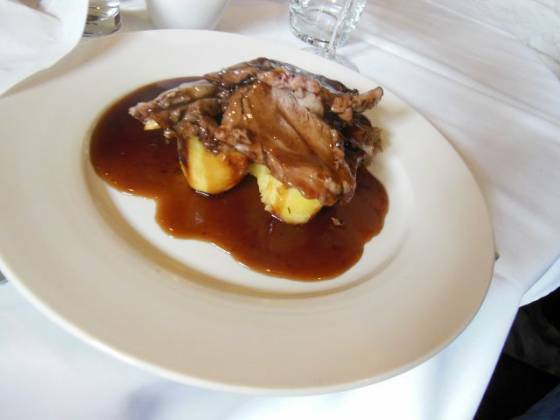 Our plates were then brought out – Claire’s roast lamb balancing on the potatoes looked good, my Sunday lunch looked magnificent, with a huge yorkshire pudding on top of the beef, lamb and roast potatoes. This was finished off with thick gravy. 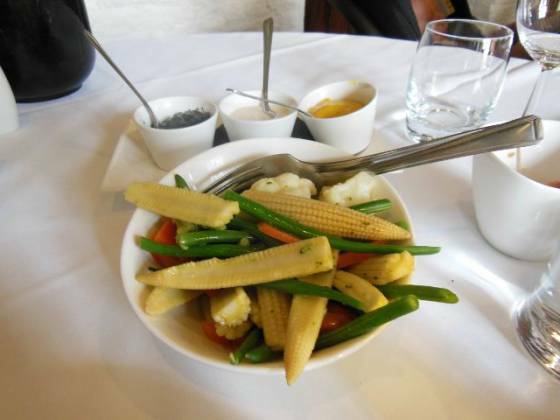 Vegetables were in a separate dish for us to help ourselves – I counted 5 different types in all: cauliflower, mini sweetcorn, green beans, carrots, brocolli and parsnip. So, what was the meat like? Superb – it tasted excellent, I had a couple of slices of each meat (beef and lamb). Claire had 2 large slices of lamb. It was tender and seasoned well. The roast potatoes were also pretty much perfect – 3-4 each, crunchy, crispy with a fluffy texture inside. They had a wonderful rosemary and garlic aroma. Underneath all the potatoes , we both found some stuffing – again tasted good (I believe it was sausagemeat). The vegetables were good, tasting fresh and cooked without being overdone. The gravy was thick and had a nice flavour to it – I have to say though, I think it was actually a bit too thick (which, for me, is saying something). If they watered it down slightly, I would have enjoyed it even more. To be honest though, the star of the show was the yorkshire pudding. Large, airy and crispy. I had to take a photo of the structure inside – superb. I was almost beaten with this meal – there was so much food and of such great quality that I couldn’t have my usual sticky toffee pudding dessert. 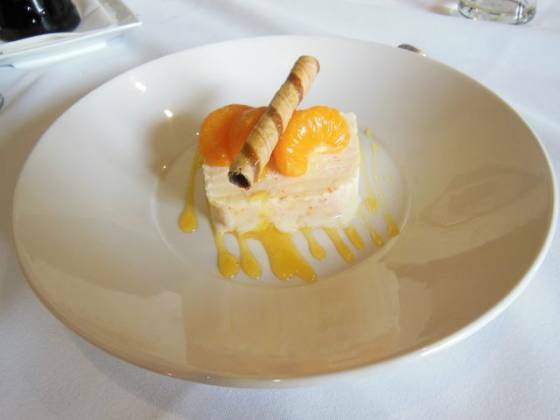 Instead, I chose the Cointreau and ginger parfait (£5.50). There were some other interesting pudding options, such as a fruit crumble, but the parfait just sounded so nice. Claire ordered a decaf coffee (£1.80), I asked for a single espresso (£1.20) to top the meal off. My dessert was brought out quickly – I made the right choice. The parfait was wonderfully light and refreshing after such a heavy meal. It was also nicely presented – I would definitely order again, although I would have to persuade Claire to have the sticky toffee pudding so I get a chance to try it! Cost for all of this – £44.65 + tip. Not bad for a fantastic meal and experience. The service here was top-notch, always on hand if we needed anything. I liked the fact that they knew what the soup of the day was, and brought the sauces out without being requested. The food quality was excellent and fairly priced considering the venue. One very small request would be to thin the gravy slightly – I enjoy thick gravy, but this was a bit too much. 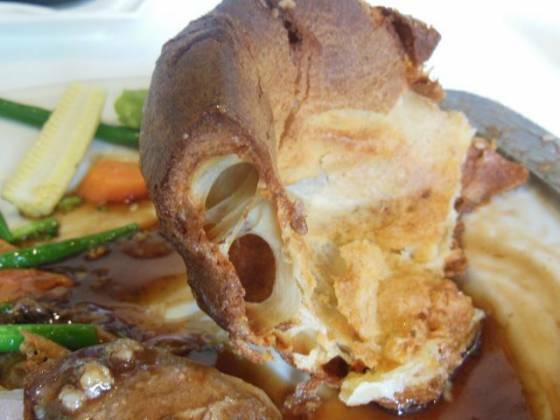 The yorkshire pudding was definitely remarkable. 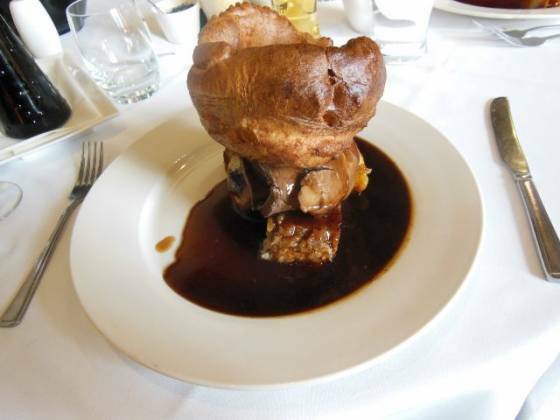 All in all, a very special and top rated Sunday lunch at Tudor Barn in Eltham.